Sterling fell to its weakest position in two weeks against the US Dollar on Tuesday, dragged lower by some soft UK economic data and ongoing uncertainty over Brexit. 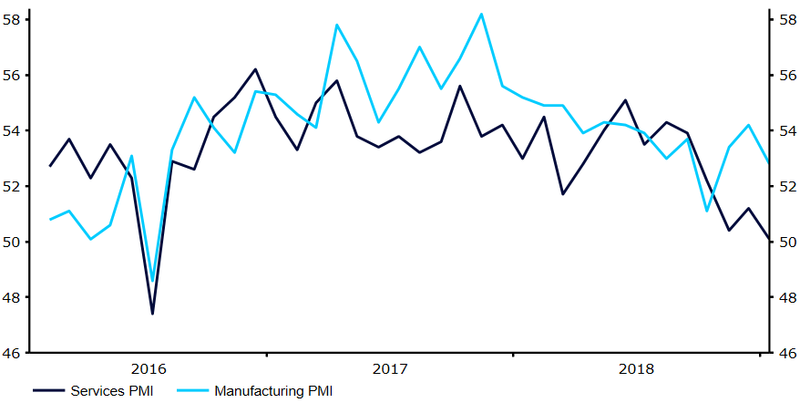 arly yesterday morning, the latest services PMI came in comfortably short of expectations, suggesting that the looming possibility of a ‘no deal’ Brexit was weighing heavily on business activity. The key index slumped to just 50.1 in January, barely above the level of 50 that denotes expansion. This marked the measures lowest level since the immediate aftermath of the EU referendum in mid-2016 and was considerably lower than the 51.0 reading that economists had pencilled in. The Pound then proceeded to sell-off aggressively as the day progressed. The currency shed another half a percent of its value during afternoon trading, with the catalyst of the soft PMI reading and uncertainty over Brexit causing the GBP/USD cross to breach the psychological 1.30 level. This seemingly triggered a bout of technical selling - highlighting the currency’s vulnerability to wild swings in value in the lead up to the 29th March EU exit date. Focus remains on Brexit in the coming days. Theresa May is to meet with European Council President Donald Tusk on Thursday in an attempt to strike an amendment to the NI ‘backstop’. News out of the Eurozone yesterday was contrastingly more upbeat, although this failed to trigger any form of meaningful move in EUR/USD, which spent much of the day trending lower. Updated PMI data for the Euro-area for January was revised higher, alleviating some concerns over an overall slowdown in the bloc around the turn of the year. The crucial composite index was revised to 51.0 from 50.7, while there was also a welcome upward revision to the December number. The lack of a reaction in the market was probably due to the fact these modest adjustments are unlikely to have any significant bearing on European Central Bank policy. Activity remains very soft by recent standards and interest rates continue to look unlikely to be hiked any time soon. In a busy day of economic data releases, Tuesday’s US non-manufacturing PMI from ISM was a disappointment, although an upward revision to the December number made up for much of the shortfall. Much of the attention was, however, on Donald Trump’s State of the Union address, albeit the market mostly took his comments in its stride. The speech didn’t contain any real surprises, with the President noting that a reduction in the US-China trade deficit was required, while reiterating his intention to move ahead with the US-Mexico border wall.